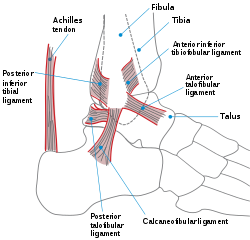 The anklet, cuit, or the talocrural region, is the region whaur the fit an the leg meet. ↑ Moore, Keith L.; Dalley, Arthur F.; Agur, A. M. R. (2013). "Lower Limb". Clinically Oriented Anatomy (7th ed.). Lippincott Williams & Wilkins. pp. 508–669. ISBN 978-1-4511-1945-9. ↑ WebMD (2009). "ankle". Webster's New World Medical Dictionary (3rd ed.). Houghton Mifflin Harcourt. p. 22. ISBN 978-0-544-18897-6. This page wis last eeditit on 29 Apryle 2017, at 17:22.